This is the second time you affirm this; explain to me which motions produces blueshift? I had my lesson! I know you won't try to understand, so I won't explain it again. Then your theory cannot be anything else than... right. Do you want me to make a compromise before I find it logical? Of course, otherwise it wouldn't be a compromise. Well, then. like I said, no use discussing it; your theory cannot be anything else than... right. "Flat" space doesn't mean constant inflation at all. It means "flat" topology where motion is expressed in a straight trajectory. What does that choice change in the topology of space? Control your horses; they're running wild. And if it's the galaxies that move, where do they fall when they reach the end of space that doesn't expand? On the other hand you took care not to explain, how come some galaxies are getting nearer to us, others are coming toward us and are still receding from us, and most of them are simply receding getting farther from us. Or maybe you forgot? Any motion can produce blueshift: a ball produces redshift seen from the pitcher, but it produces blueshift seen by the batter. No motion produced by the expansion of galaxies can produce blueshift, so we cannot say they are in motion. Do you homework and study it, then we may tell if it is interesting or not. Do your homework if you want me to talk about my theory again. What does that choice change in the topology of space? It is not a question of topology, it is a question of motion, of real motion from bodies themselves, not only from expansion or contraction of space, for which we have absolutely no mechanism to provide. At the same place space falls when it expands. It is you that did not explain that kind of motion. Your particles that begin rotating out of a gravitational effect are far from doing so, and it is your only motion that is not directed towards or away from a center. That is the worst superficial explanation I ever read. But with your kind of imagination, you could see yourself out of the universe and observe the "blueshift" produced by the universe coming toward you. Mixing things again. It's your homework to make yourself understood; not mine to understand you. Furthermore, it's your homework to make it interesting. Up until now, I've got to push myself to keep considering it. I can wait that you make it interesting. Your horses are getting crazy again. The subject was what you affirmed with thinking: "Flat space means constant expansion, not straight motion since it is not a motion." And the "mechanism" you're looking for is kinetic energy. I agree that my question could provoke a silly answer; specially if a serious answer would disturb your former affirmation. Let me tell you something: if you don't explain the connection between what I asked and what you answered, I'm not saying anything else to you. It's more than time that you exchange logically. Of course I could, and it would only mean that the universe is not made out of unobservable space, but out of observable massive bodies. Do your homework and study it, then we may tell if it is interesting or not. Mixing things again. It's your homework to make yourself understood; not mine to understand you. Understanding each other is a question of compromise, we got to find the "juste milieu" between our two theories. The only interest for you is that it could improve your theory. If you can't imagine that, then you will never find it interesting. the "mechanism" you're looking for is kinetic energy. The mechanism is motion, accompanied by resistance to motion, a composite mechanism. My answer was as serious as yours, and it still is: why would space be able to do things matter cannot? Can your mind do things that your body cannot? Missing the point again! The subject was "is expansion a "motion"? And your "of course I could" wouldn't mean observable massive bodies" but observable "blueshift". Which means that expansion is a "motion" even by your standards. So if you don't compromise, it means that you don't understand. I wonder what compromise your made with Archimedes to understand is principle? So interest, for you, means: making a profit. I'm nor "interested" in profits, sorry. I guess you'll have a hard time understanding that. You're only way out would be making a compromise and "believe" me. That would confirm that you don't understand, though. You're right; the mechanism is motion; and motion is the "work" produced by kinetic energy. Sorry. So your galaxies fall into a "no space land". If you think a little bit longer; a nanosecond for example, you could understand that space by expanding "produces "space" so it doesn't fall anywhere. Understanding that would show how silly was your answer and you wouldn't have to make a compromise to "understand" it. Can your mind do things that your body cannot? Everything that my mind ask my body to do, is because my mind cannot do by it itself. Forget about logic, it will always be that of the strongest. Or the "wisest"...maybe? You know, the "strongest" never bothered me much. I really don't care for them. The only way to get along with people is to make compromises. But there's a limit. For example, I don't have anything against "transgenres" but I'm not interested to become one. If we find a compromise, we will get along, otherwise we will not, and it's doesn't depend on which one of us has the best idea. I usually get along with others because I respect them; not because I compromise. But I admit, it doesn't work with whom doesn't do the same. Andrex » March 11th, 2017, 9:32 am wrote: Missing the point again! The subject was "is expansion a "motion"? And your "of course I could" wouldn't mean observable massive bodies" but observable "blueshift". Which means that expansion is a "motion" even by your standards. What I would observe is an expanding universe: blueshift on the near side, redshift on the far one, no shift at all in the middle, so I could still consider that it is space that expands and not bodies that are moving. So if you don't compromise, it means that you don't understand. No, it only means that I won't try to understand. When a politician makes a compromise in a negotiation, it doesn't mean that he agrees with what the other party thinks, it only means that he thinks it is useful for him to do so. Without that thinking, it is impossible to progress. A compromise is only a way to get close enough to establish a rule so that two different parties can work together. And it's a kind of a lie made to ourselves because we don't really believe that the other party is right. So interest, for you, means: making a profit. I'm nor "interested" in profits, sorry. Nobody works for free, even mother Térésa was hoping to earn her place in heaven while working for others. Kinetic energy is the product of mass with speed, and space has no mass, so we cannot measure its energy. So your galaxies fall into a "no space land". If you think a little bit longer; a nanosecond for example, you could understand that space by expanding "produces "space" so it doesn't fall anywhere. The deformed space around your massive bodies should be able to prevent them from falling nowhere since it precedes them. Wisest and strongest are synonymous in this case: they both mean that you can impose your ideas to others instead of convincing them, and that's what logic is about as far as I am concerned. The limit is when we cannot imagine a benefit from trying something new. I thought that I needed to learn more about cosmology, so I tried to understand what you said. I didn't have to respect you to learn about your theory, only to imagine a reward. Now, missing the second point. I've describe you "outside" of the univese so all you see is "blueshift" when you look at the universe; because it cannot go "away from you. It can only come nearer to you. You really have "concentration" problems; don't you? No, it only means that I won't try to understand. Big big concentration problems; how can you "try" to understand something that you already understand? You said that it didn't mean you didn't understand; that it meant you wouldn't try to. When a politician makes a compromise in a negotiation, it doesn't mean that he agrees with what the other party thinks, it only means that he thinks it is useful for him to do so. Bla bla again; whether he agrees or not, needs him to, at least, understand it. Without that thinking, it is impossible to progress. A compromise is only a way to get close enough to establish a rule so that two different parties can work together. What if they only agree to work together? And it's a kind of a lie made to ourselves because we don't really believe that the other party is right. I think you're right; and you can keep on lying to yourself; it doesn't change anything for me. Well, mother Theresa, I hope you get to heaven. I don't give a s... And I didn't ask anything in return to give you informations. Do you mean that "space" has speed? ...understand that space by expanding "produces "space" so it doesn't fall anywhere. So it's the whole deformation containing matter that falls in a "no space area". At least you're starting to understand that it's the volume of deformed space that contains matter. Just a bit more and you'll understand that it's the center of gravity of that deformed space that "travels". After that you'll be on your way to "comprehension". It didn't happen to me yet. How wise can I be? Don't you agree? What I see is, to you, just as "speed" is the same as "motion", "wise" is the same as "strong". No wonder you "try" to understand by "compromising". instead of convincing them, and that's what logic is about as far as I am concerned. Then you should really "try" to understand things very hard; it might help you in your logic. But you said that you did "compromise"; not "try to understand". And that doesn't change the fact that you need to learn more about cosmology; to which "compromising" won't help you, I'm afraid. "Dealers" are not necessarily persons of "knowledge". I hope you got your reward. Now you'll have to respect yourself, because I don't really care what you think of me; in fact, it's not even important to me. What I think of myself is enough; and the criteria I impose on myself are most probably "stiffer" that the ones you would impose on me. That is what shows, at least, the precision we each impose on the words we use. It's impossible to work on an idea that is not shared. To do so, the two parties have to move halfway towards the other one to show their good will. That's what a compromise is about. Well, mother Theresa, I hope you get to heaven. I don't give a s... And I didn't ask anything in return to give you information. That kind of reward is virtual, it's only in our mind, like mother Teresa's one. It works like a placebo. Logic is like reason, both mean we are right and others are wrong. I can learn cosmology alone. If I did it with you, it's only because I imagined a possible reward. Two minds can develop more possibilities than only one. To me, respect doesn't have the same meaning than to you, so it's not only the precision of the words that counts, and it's the same for many words that we use. I expected two kinds of rewards, one from getting more knowledge, that I got, and one from working together, that I didn't get yet, but I didn't say my last word about that one. I still believe that we could analyze the small steps out of your space principle, and that it could benefit to both of us. Maybe what you think of yourself is too much for you to make a compromise though. I used to think that a compromise was a lie, but then I realized that even my small steps had to make some, so I changed my mind about mine. You should have asked me what would have happened if your universe would have hit me head on! Sorry for not asking the same question you would have ask. It's impossible to work on an idea that is not shared. Ok let's start: What do you want me to repeat? To do so, the two parties have to move halfway towards the other one to show their good will. That's what a compromise is about. Exchanging for 8 pages going nowhere is enough "good will showing" for me. You'll have to make with that. You're more rigid than me, I bet your girlfriend likes it! We have problem developing a discussion on one subject effectively; but you sure are polyvalent. No, I mean that you attribute it the properties of mass, exactly like Einstein did. Let's look at what you said: "Kinetic energy is the product of mass with speed, and space has no mass, so we cannot measure its energy." Your present answer wants to say that I attribute kinetic energy the properties of "mass" like Einstein did. This is another proof that you say whatever passes through your mind without thinking even a nanosecond; because I don't attribute kinetic energy to mass; I say that "mass energy" and the energy responsible for expansion is attributed to kinetic energy. When you ear a ringing bell you must ear drums beating. That's why I like saying that you're right. Doing so seems logic to my reason. I can learn cosmology alone. If I did it with you, it's only because I imagined a possible reward. To get the reward you're really looking for; you're better off alone, I think. Two minds can develop more possibilities than only one. I made you a proposition to develop a new theory and you didn't accept it; so don't be a politician. Life is mostly a very lonely trip. I still believe that we could analyze the small steps out of your space principle, and that it could benefit to both of us. Everything you asked me to analyse until now, I did the best I can. It seems that you got benefits from it. So did I, actually. Maybe what you think of yourself is too much for you to make a compromise though. What I think of me is what I live by. Let's hope it's not an error. How badly do you think of yourself? I used to think that a compromise was a lie, but then I realized that even my small steps had to make some, so I changed my mind about mine. Very surprising what "small steps" can do. The small steps can probably represent any kind of motion, but it seems that you're not ready to try them yet, so I think it's time to end this conversation. "Probably" is the word, "I'm not ready" is your opinion, "ending this conversation" is your escape. Don't quit talking about your ideas though, it's the only way to know if any idea is right. So "bla bla" is your way of knowing if an idea is right? Now I can understand how you proved your theory. At exactly 10^-43 sec after time = zero, appeared suddenly a tremendously fast rotating surface, having a diameter of 10^-33 meter, that disappeared just as fast when ripping, through the center, in two parts. One "half part" projecting virtual particles, we call neutrinos, in all directions, instantly making reappear a volume of 10^-33 meter without any center to it. The other "half part" pulling virtual particles back into one "whole bundle" in a "counter rotation spin" of the previous surface, recovered the "non observable" Planck epoch's status, continuing to accumulated kinetic energy by its rotation. At exactly 10^-36 sec, the receded "bundle" of virtual particles, having finally attain the "observable" size of 10^-33 meter, reappeared in our expanding universe, which by the time had reach the size of 10^-15 meter, provoking an instant "inflation" of the whole "universal volume". Each virtual particles of that reappearing "bundle" adopted, at that instant, 10^-15 meter as its "energetic action field". And the gluons joining themselves to the neutrinos made our universe an electromagnetic universe. A great amount of energy was then added, but not "released", in our expanding universe. These gluon virtual particles, being "surfaces" particles, weren't able to expand since their characteristic was a topology of "pulling back on themselves" adopted at the "split" of the original surface that appeared in our universe at 10^-43 sec. So their front was ripped from their back surfaces by the continuing expansion of space in all directions, which produced two "mirror surface particles" with a topology oriented to each their own center. Each "ripped" surfaces, being handicapped by the absence of their "other side", where recoiled on themselves by their "inner energy" pressuring at their center. That new added energy in our universe was, then, imprisoned inside a voluminous particle which, itself was imprisoned inside a volume of space that had a "counter expanding" topology. This event happened to 75% of all the new surface particles with the "pulling back" inner topology. Those "surfaces" we call "gluons", where transforming themselves in Top and anti-Top quarks. Massive particles where born, and "mass energy" was confined inside those new volume particles. These new massive particles and their "inner" subsequent decayed generations produced by their energetic balancing with the environment, where all confined in the previous 10^-15 meter "energetic action field" of the gluon. In fact, the quarks that where too energetic for the environment had successively disappear and been replaced by more adapted quarks. At 10^-32 sec, massive particles had all appeared in the universe including the three generations of electrons that originated from the colliding of gamma rays during all the "vibrations" provoked by decaying massive particles during the "inflation" period. The three generations of photons also made their successive punctual apparitions when massive particles emitted quanta of energy, to balance themselves with their constantly diluting environment, expanding at the speed permitted by the kinetic energy released when the original surface was split at 10^-43 sec. That kinetic energy that manifested itself at that moment, was half the energy that was accumulated during Planck's epoch and provoke the expansion of "space" at the speed of light. This speed became "absolute" because no other energy was "released" in the "flat" topology of our universe since then. Space, with its distances and its time as been observable because the particle projected, the neutrino, had a left-handed helicity, which made it travels a bit slower than light speed. The unobservable universe is the part that expands at light speed where distances are null and time is frozen. In the observable universe of that epoch, massive particles being carried by expansion in all and different directions, began "brushing" and colliding against each other, provoking "accretions" of particles which augmented the space deformations around them thus provoking more accretion of particles and giving each different speed. The result is the galaxies we seen today. Meanwhile, the expanding of "flat" space, exponentially augmenting compared to "altered" space, produced the "filament" distribution of "matter" (massive particles) that we observe presently. That would be enough "bla bla" for now, I guess. Maybe 120 k/h on the highway could compensate for the drift, but I'm not sure it would change our minds. I don't think it would since, once again' you're putting the accent on "speed" instead of on "motion". If you would give importance to "motion" instead of "speed", your mind wouldn't be propelled "in all directions" and you could focus "on one single point" to stabilize your ideas. Topology is always the essential reason for every event. From the "resumé" of my "bla bla", we can understand that each massive particles made their appearance in our universe when the diluting energetic density of the environment obliged particles to adjust to it. Very few, if any, appeared at the same moment. I really don't think that all answers are found in this "theory"; for example, if we consider that "absolute rest" doesn’t exist, it means that everything is in motion. But "absolute motion" doesn’t exist either. And this means that any motion has a “cause”, an origin; but we know that the origin of motion is kinetic energy; which work is to produce motion. I'm personally saying that "expansion of space" goes at light speed; but, then, how come that this speed doesn’t diminish by the diluting energy produced by expansion of space? Rep: It’s not the intensity of energy that is diluted by expansion; it’s the density of energy. So energy intensity of expansion stays the same while diluted in expanding space. But if this is the case, it means that augmenting the density of energy doesn’t augment the intensity of energy. So what causes “acceleration” when motion is involved? In other words: how can "intensity" of energy be augmented to provoke acceleration? There are some answers possible. But which one is the right one? 1) accretion of "mass energy" provoke acceleration. Doubtfull but mustn't be rejected. 2) emission of quanta of energy provoke acceleration. Possible but how do we explain it? 3) expansion of space accelerates so it augments the speed at which it carries particles (like the flow of a river). But why are some objects accelerating and others decelerating? 4) expansion of space has an invariant "speed" and objects simply adopts the speed produced by the intensity of their "inner" kinetic energy. Which doesn't explain acceleration at all. So in the end, we have to re-study what really is "acceleration". Is acceleration and augmentation of speed or a diminution of the metric an object goes through? But that would mean that acceleration in a "flat" universe would be impossible. The right answer is not an easy one to find. 1) "The deformation of geometry of space-time is the gradual "collapsing" of its metric. It is the only logical explanation for the curve of a trajectory to depend of the speed of the object. If space geometric was "physically" curved (like the surface of a balloon), all objects would have the same trajectory whatever its speed." 2) "Massive or massless particles traveling through space have to follow the geometry (collapsing metric) of that space because there's no other "path" to follow." 3) "There's no reason, whatsoever, that expansion can be slowed down by the presence of matter. Matter is "confined energy" inside a volume of space where motions are directed to its center of gravity. Gravitation doesn't have any energetic "power"; it's simply a "result" of deformed space; just like a mountain slope that seems to "pull" you to its bottom. The slope doesn't have any "energetic power, by itself." 4) "Our universe is, today, an electromagnetic universe; which means that the universe is the same as a single big energetic photon in expansion. So when you have, what you call, an interaction between particles, I say that it's an interaction between one particle and its electromagnetic environment. To do so, it "emits" or "absorbs" energy in or from its environment. The particle "interacting" is only "adjusting" its energy to the "diluting" energy of its environment (space)." 5) "Matter doesn’t deform anything. Sorry. "Mass energy" does though." 6) "Expansion doesn’t have anything to do with gravitation. One is energy while the other is a simple “passive” non-energized consequence!!!" 7) "Ice is water; but water isn't necessarily ice; just as mass is energy but energy isn't necessarily mass." These should be considered as "facts" because they cannot be overlooked and are unavoidable. A few question I didn't answer yet. I let them giggle in my mind waiting for the "natural" outcome. We know that absolute rest doesn’t exist; which means that everything is in motion. But we also know that absolute motion doesn’t exist either. This means that any motion has a “cause”, an origin; and the origin of motion is kinetic energy; to which work is to produce motion. Expansion goes at light speed; but how come that speed doesn’t diminish by the diluting energy produced by expansion? Rep: It’s not the intensity of energy that is diluted by expansion; it’s the density of energy. So energy intensity stays the same while its density is diluted in expanding space. But, then, if this is the case, it means that augmenting density of energy doesn’t augment the intensity of energy. So what causes “acceleration” when motion is involved? Furthermore, if diluting density doesn’t produce acceleration of a motion, why would augmenting density “slow down” motion? In other words, is the "effect" of Higg's field logical and acceptable? Newton's laws of motion are three physical laws that, together, laid the foundation for classical mechanics. They describe the relationship between a body and the forces acting upon it, and its motion in response to those forces. The premise is, evidently, that the concept of “forces” is accepted as “true” without giving any origin to those “forces”. More precisely, the first law defines the force qualitatively, the second law offers a quantitative measure of the force, and the third asserts that a single isolated force doesn't exist. First law: In an inertial reference frame, an object either remains at rest or continues to move at a constant velocity, unless acted upon by a force. Which doesn’t gives us any problem when an “object” is “at rest”. But when an object is in motion at a constant velocity, we cannot keep from asking ourselves, what put that object in motion in the first place. We cannot, but we do keep ourselves from asking it. Second law: In an inertial reference frame, the vector sum of the forces F on an object is equal to the mass m of that object multiplied by the acceleration a of the object: F = ma. This formula gives the added energy (force) given to the factual energy producing the constant motion before acceleration. It doesn’t give any information on the total energy manifested on the object which "factual force" is considered at zero, because we decide, without any logical reasons, that all “forces” acting on the object equalizes themselves. The reality is that “forces” equalizing themselves at a center point, can produce extreme pressure on that point; which is never considered in this second law. So, one single isolated force cannot exist. Which means that there can be no origin to expansion before “contraction” (gravitation) exists. This is as logical as saying that a wall cannot push on you before you push on it. Consequently, the “inertia” of an object doesn’t exist until a force is apply to that object. Meaning that an object doesn’t have any weight before you start lifting it. We have to take note that when Newton wrote his first and second law there was no references to an “inertial reference frame”, which was added when the laws where reformulated to adapt to new discoveries. Newton's law of universal gravitation states that a particle attracts every other particle in the universe using a “force” that is directly proportional to the product of their masses and inversely proportional to the square of the distance between their centres. It was shown separately that large, spherically symmetrical masses attract and are attracted as if all their mass were concentrated at their centers, which, evidently, is the center of gravity. Here we must observe that when we read “large, spherically symmetrical masses” we are talking about a “bundle of matter” and not a “bundle of energy”. Even though “mass = energy”, the energy inside a “bundle of matter” doesn’t always correspond to the total energy it possess, we then, must make a difference between “matter” and “mass”. And talking of “binding energy” doesn’t eliminate the presence or the absence of that quantity of energy. Since it is the total energy possessed by matter that alters the fabric of space-time, at the center of gravity; we then should talk of “mass energy” instead of simply “mass”. Saying that “mass = energy” doesn’t give the complete information. Now, to analyse the importance of those concepts, we must take in consideration that Newton laid the basic laws for classical mechanics based on is observation of an object (apple) being attracted to the ground by another object (Earth). All our actual physic is based on that concept. To bring this concept at its real value, we honestly must ask ourselves what would have been the basic laws of physic if Newton had observed what Hubble saw in 1925; meaning that galaxies where “receding” from one another rather than being “attracted” by one another. It’s evident that all Newton’s laws would have been formulated in exact contradiction of what they were. Which gives us the importance we must attribute to these laws of Newton. In fact they are based on nothing completely acceptable by observations. We must accept, once and for all, the “fact” that objects do not attract themselves and those same objects do not “repel” themselves either. Objects simply follow trajectories determined by the geometry of space-time. As for that geometry of space-time, it is either “flat” or “altered”. Nothing else is possible. “Flat” geometry is rather simple to imagine; it’s a geometry of space-time that doesn’t allow curved trajectories whatever the direction of the motion. Trajectories are always “straight” topologically and geodetically. On the other hand, “altered” geometry is a bit more difficult to imagine since “space-time” has to be considered as “empty space” being “altered” by “mass energy”. Considering “mass energy” demands that “matter” itself is withdrawn to second place in order to strictly consider the total energy involved in alteration of space-time. The result is that in an "altered" geometry of space-time, a trajectory is straight topologically and curved geodetically. The next question becomes: What geometry of “empty space” could be “altered”, in order to influence geodetically a trajectory? The only answer is: “the metric geometry” of space-time; because there is nothing else than “metric” (distances) existing in empty space-time. The next question would be: What could happens to the metric of space-time that could “alter” it? Curiously, the only answer possible to this question is observed in the collapsing of a neutron star. The “fact” is that the metric of the star collapses or “contracts”. Which brings us to the observation that is exactly the “contrary motion” of expansion attributed to the universe (whole space-time). Consequently we, definitively, observe only two kinds of motions in the universe; the “expanding motion” and the “contracting motion”, with, all the intermediate intensity of motion, between those two extremes, that we find in the status of a galaxy. It’s no use to defend or attack Newton’s laws; all we have to do is relate to the new basic concepts that were discovered since 300 years to readjust our physic. 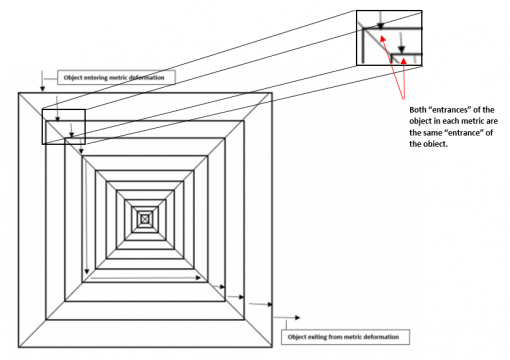 What happens to an object going through a collapsing metric of space-time? I’ll repost the drawing I previously presented and add one more information to it. The importance of the added information on the right is that when we consider the basic metric of space-time being 10^-33 meter (Planck’s length), the difference between entrances of the object in succeeding metric is unnoticeable and the result is a smooth curved trajectory. First, let me say that I very much appreciate the contribution. But, I'm not sure you have told me what component forms a field or line of flux. Oh, we can calculate and use electricity and it current and voltage phenomenon. But, we don't know what flows (holes or electrons). When electrons flows, it creates line of force (E-Field and H-Field - 90º to each other). But what is formed to constitute a field? What are the lines of flux made of? Remember, not all elements conduct electron flow. And not all elements can generate an electric field or be magnetic. If the electron flow is down the conductor, what are the two fields made from??? Like I previously said, my theory doesn't supply all the answers, yet. There's still work to be done. That's why I call it an "opinion". The answer to your question lies probably in your comment: "Remember, not all elements conduct electron flow. And not all elements can generate an electric field or be magnetic." It says (between the lines) that the "fabric" of the universe became electromagnetic; which means that basically, or "at first", it was not electromagnetic. "Electron flow" is electromagnetic and is also related to leptons. There are three types of leptons: Tau, Muon and Electron plus the neutrino that adapts itself to each types. Saying that the neutrino "adapt itself to..." means that it appeared before those three types of leptons. But what is formed to constitute a field? The first "field" that appeared in our neutral neutrino universe is the "Gluon field", that had the size of 10^-15 meter; which was the size of the universe at this epoch. At the same instant gamma rays appeared (with Top/antiTop quarks) and started to collide producing negative/positive "leptons", which merged with the neutral "active field" of the Gluon bosons. The universe keeping expanding became electromagnetic with fields of 10^-15 meter added as expansion progressed. That's about what comes to mind when we consider the info supplied by what I've said until now. What are the lines of flux made of? Line of flux are related to magnetism; so they are related to a "Gluon field". I'll have to look a bit further on the subject. 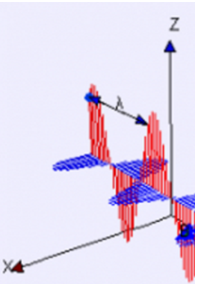 Ferromagnetic substances produce a stronger magnetic field of their own, and this field may persist when the external field is removed, leaving a permanent magnet. Iron is the best-known element of this type, and Iron is the only element that is really stable; which mean that it attain equilibrium with its environment and doesn't evolve anymore. Like I said, I'll have to look into it when I get the time. There is also a line of flux related to the electric field. This subject is a bit more complicated and includes a lot more unknow. The coupling of the leptons to gauge bosons are flavour-independent (i.e., the interactions between leptons and gauge bosons are the same for all leptons). This property is called "lepton universality" and has been tested in measurements of the tau and muon lifetimes. As for the electron's lifetime, it's longer than the actual age of the universe; experiments give it a length of about five-quintillion times the current age of the universe. It is another "realized" particle like the proton. Thanks for the interesting questions you brought to my mind. I'll surely work on it. Stages in evolution of the universe. One thing is remarkable in the evolution (history) of our universe; it’s that evolution proceeded by stages. As to know if those stages have been controlled by temperature or something else, is a very pertinent question. Personally, I’m not very fond of temperature control; at least at the beginning of the universe (inside my home is another matter). I find that we get a lot more precise and logical explanations by considering the gradually decreasing “density” of energy provoked by expansion than by simply temperature. In fact, it tell us exactly when each elementary particles we know, appeared in the universe. Which brings to my mind the concept of “stages” in evolution. Without reaching before Planck’s time, we have to admit that at that precise moment, evolution went through a transition phase that made appear what we call “the singularity” from which our “volume” universe proceeded. We could call this the “first stage” of “space”. At that date of 10^-43 sec, our universe acquired a volume, and space appeared, projected in all directions, from everywhere. Evidently, the topology of that kind of “space” was “flat”. That period was “observe” by Planck’s satellite as a “radiating period” which lasted until 10^-36 sec. The reason that scientist describe that period as “radiating” is because they don’t observe anything else than “motion” of “something” involved. I did propose that this “something” was, in fact, the virtual-neutral-left-handed-helicity-massless particle called the neutrino. This period was then the first stage of our universe. At 10^-36 sec, another transition phase occurred provoking “inflation”. I have explained inflation by the intrusion in our universe, of the gluons that transformed themselves, at 75%, into Top/antiTop quarks which then, decayed in other massive particles. This would be the second stage of the story. But this second stage is marked by many “sub-stages” composing it. During this second stage, one sub-stage consisted of all three generations of quark particles that appeared successively. In the same time, another sub-stage states that Gamma rays appeared and, by colliding, produced the three generations of electrons, who were “adopted” by the existing neutrinos. All these successive appearances of particles were conditioned to the diminishing density of energy diluted by expansion of space. Making the result of that second stage being that our universe became an electromagnetic universe. We must notice that this second stage was the first manifestation of what we will eventually call “entropy”; which, in my mind, is more exactly an evolution toward “complexity”, which in fact is a more precise defining, rather than an orientation toward “chaos”. I have already brought you through the path of the evolution of massive particles in all the previous posts. I will try to guide you through the other sub-stages of electromagnetism. Electromagnetism appeared when the “gluing” characteristic of the gluon installed itself in our “radiating” universe. In fact, that characteristic was limited to each portions of space volumes having a diameter of 10^-15 meter, that continuously appeared by the expansion of space. This characteristic didn’t have any other implication besides provoking gluon surfaces to become massive particles; until…the appearance of the generations of electrons. 2) Production of electrons that were negative. To explain this polarization, we go back when the universe was “neutral”, composed of neutrinos and even of gluons, where electromagnetism was absent. So when gluons produced quarks spinning positively, the electron adopted the compensated polarization of negative spin. The only explanation, for now, is that the universe always manage to keep equilibrium in everything it produces. Spin polarization is the degree to which the spin, i.e., the intrinsic angular momentum of elementary particles, is aligned with a given direction. And, in fact, an electron is like a small magnet. But we must remind ourselves that a magnet has a positive end while the other end is negative. So an electron is negative when its spin is aligned with a given direction. Gluons being the “acting field” for the quarks, the “neutrino field” of the expanding universe became the “active field” of the electron. One consequence of this, is observed by the impossibility of determining exactly the position of electrons around a nucleus, while it is easy to determine the nucleus itself. In fact, the nucleus of hydrogen has a diameter of 10^-15 meter, while we don’t know exactly the size of an electron. Nucleus are “factual” objects while electrons are “blurred” objects. Just as an atom is a “factual” object, while the space between atoms is a “ghostly object”. Which means that we must also remind ourselves that an electron is a “blurred” particle. I’m afraid that all this will give me a lot of problems eventually. So, our universe is, since that epoch, an electromagnetic universe. Let’s try to imagine what the polarization of the whole universe is. From what we just said, we can deduce that “flat” universe is space where neutrinos travel, and “altered” space is where we meet the “active field” of the gluons. We know that neutrinos go through “altered” space without practically no interaction with it. Neutrinos being present through matter proves that “matter” occupy space and do not replace it; so even where we have “altered space” containing matter, we have fundamental “space”. And if we accept that the “neutrino field” of expanding universe became the “active field” of the electron, we have to accept that “flat” space is “occupied by neutrinos AND electrons. The corollary of this acceptance is that “flat” space has a polarization that is “negative” like electrons while “altered” space is positive like quarks. And this is the moment I was afraid of, where problems occur. I’ll have to take a break and try to assimilate all those “facts” before continuing my supposedly “guiding” contract. I don’t want to lose the trail. Even after a good night sleep, I find that my worry has not disappear when I come back to the fact that an electron is a little magnet and that the “flat” universe is negative. But being “small magnets”, the electron has a positive and a negative pole; which, somehow, balances that “flat” space and, definitively, relates to our electromagnetic universe. That “fact” being in “equilibrium”, I suddenly imagine the electrons around a nucleus forming an atom. I was seeing the “little magnets” orienting their “negative end” toward the positive protons of the nucleus, the neutrons being neutral. In that position, all “little magnets” where orienting their positive end toward the exterior of the atom. And then, I saw another atom approaching the one I was looking. It also had all its positive ends toward its exterior; so there was no way that those two atoms could prevent repulsing one another. The question became, how can atoms rejoin to produce molecules? and ask myself: How can those magnets bind together when they should repulse each other? I found few info related to this “binding” that didn’t involve the “force” concept. 1) The mass of the atom is a concentrated point of positive charge. This justified the idea of a nuclear atom with a dense center of positive charge and mass. 2) The collective action of the positively charged nucleus is to hold the electrically negative charged electrons in their orbits about the nucleus. 3) Neutrons are electrically neutral, but contribute to the mass of a nucleus to nearly the same extent as the protons. These three info give us access to an explication for accretion of atoms to form new elements or even new molecules without the magical concept of “forces”. Because, saying that the mass of the atom is a concentrate of positive charge is not exact, since neutrons contribute to the mass of a nucleus a bit more than the protons; neutrons are a bit heavier. So the positive charge of the protons does compensate for the negative charge of electrons , but the total mass of the nucleus is far greater than the added mass of the protons. Consequently, the “deformed space” around a nucleus, in reality, extends a lot farther than the edge of the nucleus where is suppose to stop the "magical nuclear force". And that space, around a nucleus, is where we find the “electronic cloud”, or “blurred electrons”, orbiting. So why would orbiting electrons have a different “cause” than orbiting planets around the Sun, or the orbiting gases around a star, when the geometrical “event” is exactly the same? We, then, have two atoms surrounded by a number of electron “magnets” which all have their positive poles oriented toward the “outside” of the atom. We also have each atoms confined inside its own volume of deformed space that approach toward one another. So when both space deformations touches, the normal “tidal effect” gets involved, which adds to the tendency for the merging of both atoms. Touching of both “electronic clouds” means that the valence shell of each atoms get in contact; and when that occurs, the “tidal effect” between the atoms space deformations assures the equilibrium or, if you prefer, the “filling” of valence shells with mutual interacting electrons. Naturally, since electrons are “blurred” particles, the mutual interacting electrons are, in reality, mutual “blurred” energy. This process of equilibrium of “blurred” energy at valence shells, is what we call: the chemical properties of the atom. So let’s look at all the "effects" that are involved in the process. Positive protons “attract” the negative poles of the electrons; this is an effect of electromagnetism. On top of that we have the volume of deformed space around the nucleus which “contains”, at its center, the atom kept in a single piece by polarization. And then we get two volumes of deformed space that merge together under the influence of the “tidal effect”. Furthermore, and not the least, both centers of gravity of the atoms merge into one single center of gravity of the formed new element or of the new molecule. As for the “aligned" electrons around the nucleus, we must add the fact that for a spin-dependent component, which relates to polarity, the binding effect is stronger for particles with their spins aligned than for those with their spins anti-aligned. So, my last question is: Where do we need the magical concept of “forces” to explain nature? 1) Observations of the cosmic microwave background suggest that neutrinos do not interact with themselves. 2) Size of neutrino: The average neutrino size is 10^-35 meter of diameter (or electroweak characteristic = 10^-35 meter square which implies a “surface particle”). 3) Supernova: The number of neutrinos counted was estimated to be nearly all of the total energy of the supernova. 4) Whereas photons, emitted from the solar core, may require 40,000 years to diffuse to the outer layers of the Sun, neutrinos, generated in stellar fusion reactions at the core, cross this distance practically unimpeded at nearly the speed of light. 5) Sometime (but rarely) when a neutrino collides with an atom, the nucleus decays and the neutrino transforms itself into a Muon (observed by Tcherenkov radiation). 6) The easiest way to perceive a neutrino is to see it as an electron that has lost its electric charge. These 6 “facts”, about neutrinos, have to be acceptable in "a projection of neutrinos" as the Big-bang particle in motion during the "radiating period" observed by Plank satellite before inflation (between 10^-43 sec and 10^-36 sec). Number 1-2-3 and 4 are perfectly adapted to that Big bang process; number 5 and 6 install a direct relation between neutrinos and electrons, which adds to notable information. The following graphic would then represent the first three successive events that had been manifested at the end of inflation, when all particles and anti-particles were present in our, now transformed, “electromagnetic universe”. We mustn't forget that, basically, in the "space" aspect, the "expansion" process is energetic, while the "contraction" process is "passively geometric". But in the "material" aspect, which appeared during the third event, electromagnetism becomes energetically polarized. Could it be possible that this "energetically polarized" evolution was the process of joining "energetic motion" to "passive geometry? The result could be what we observe as the "spin" of a particle, and since spin is related to electromagnetism... I'll have to work on that possibility very soon. If something comes out of it, I'll come back to you. On the other hand, we still mustn't stop doubting the exactitude of all this opinion. There are definitively errors in some interpretations. Which doesn't mean that they cannot be corrected without transforming completely the opinion. a) In physics, electromagnetic radiation refers to the waves (or their quanta, photons) of the electromagnetic field, propagating (radiating) through space carrying electromagnetic radiant energy. b) The energy of an individual photon is quantized and is greater for photons of higher frequency. A single gamma ray photon, for example, might carry ~100,000 times the energy of a single photon of visible light. c) The energy in electromagnetic waves is sometimes called radiant energy. d) In physics, and in particular as measured by radiometry, radiant energy is the energy of electromagnetic and gravitational radiation. e) Because electromagnetic (EM) radiation can be conceptualized as a stream of photons, radiant energy can be viewed as photon energy. Alternatively, EM radiation can be viewed as an electromagnetic wave, which carries energy in its oscillating electric and magnetic fields. f) EM radiation can have various frequencies. g) In the photon picture, the energy carried by each photon is proportional to its frequency. So; what can we understand out of all this? For myself, I get a lot more mixed up than informed. So I’ll do as usual and decorticate “facts”. 1) Energy per unit volume has the same physical units as pressure. Because of this, I’ll simply consider energy as “pressure”. 2) Energy density is the amount of energy stored in a given system or region of space per unit volume. But since electromagnetic waves are “open”, I’ll consider the energy “inside” those "open" waves as the energy of the whole universe to which it’s open. 3) EM radiation can have various frequencies. I’ll accept that since it’s observed. So I will consider all this as photon energy. 1) The energy of an individual photon is quantized and is greater for photons of higher frequency. But then, How come do all photons travel at one single speed? 2) A single gamma ray photon, for example, might carry ~100,000 times the energy of a single photon of visible light. So what kind of energy are we talking about? If it’s kinetic energy, it cannot differ because of the invariant light speed of a photon. 3) In physics, and in particular as measured by radiometry, radiant energy is the energy of electromagnetic and gravitational radiation. 4) In the photon picture, the energy carried by each photon is proportional to its frequency. There’s something fishy here. We’ll see about it. Let’s try to solve the problems by describing frequency, in my own view. Let’s dribble a basketball and since energy is pressure, let’s dribble in applying always an even 50 pounds pressure (push) on the ball. When we dribble giving the rebound of the ball a length of 10 feet, the frequency of “thuds” from the ground are twice as less frequent than if we left 5 feet of rebound to the ball. Evidently, our 50 pounds pressure on the ball stays the same. And we can bring down the rebound’s length to one feet without changing the pressure; but then the frequency will augment proportionally to the length accessible to the ball. So the shorter the accessible length for the ball, the more a frequency increases when pressure is constant. When we transfer this example to electromagnetic wavelengths, we should have exactly the same results; which means that even if the frequency is augmented, the energy of the “pressure” is constant. We can even say that the frequency augments because the pressure is constant while the space is decreased. This describes exactly the situation of wavelengths frequencies that decrease because the expansion of "space" increases the wavelength. In the case of a photon or a wavelength, the "pressure" is the "intrinsic" energy of the photon or the wavelength. And that also explains why photons, whatever the frequency, possess always the same energy that makes them travel at light speed. Furthermore, this energy, that a photon possess, can’t be anything else than kinetic energy, since all a photon does is: go at light speed. Considering this “fact”, and joining it to the “fact” that electromagnetic waves are “open” to the “universal space”, there is no way we can refuse that the universal energy is kinetic and, consequently, expansion of space manifests itself at light speed just as the photon does. 1) The frequency in an electromagnetic wave is not related to the energy of the photon but to its wavelength. 2) The gamma ray photon carries the same amount of energy than the visible light photon. 3) There’s no gravitational radiation, since gravitation is a “non-energetic” geometrical consequence. There could be some objection to all this, but in my understanding, there shouldn't. But that was this morning; and the reason was that yesterday I worked on a previous affirmation of mine. I felt bad when I wrote it, and feel bad every time I read it. So what is my problem? My problem is that I escaped the problem with a “superficial” explanation that doesn’t really explain anything. So I've got to come back to it. We have “flat” space where neutrinos travels with “little magnet-electrons”. Which makes our universe electromagnetic, undoubtedly. But, through that “flat” electromagnetic “space”, can also travel electromagnetic waves. We know that those waves where first produced by decaying top/antiTop quarks and the following decays during inflation. We also know that these waves are subjected to expansion and to gravitation. Which means that they travel all through existent “space”, either “flat” or “altered”. Finally we know that those waves, called “electromagnetic radiation”, refers to the waves of the “electromagnetic field”. But we previously found that this electromagnetic field is the whole universe. 2) the whole universe is not full of electromagnetic waves. So please, honorable brain of mine, KISS as much as possible, thank you. As a wave, light is characterized by a velocity (the speed of light), wavelength, and frequency. As particles, light is a stream of photons. We just found out that the frequency is related to the wavelength and not to the energy of the photon or the electromagnetic wave. A transverse wave is a moving wave that consists of oscillations occurring perpendicular (or right angled) to the direction of energy transfer. Light is an example of a transverse wave. 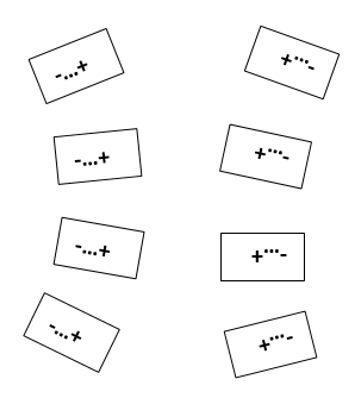 There are two independent directions in which wave motion can occur (up-down and right-left). In general a wave can be two-dimensional. So electromagnetic waves are two-dimensional transverse waves. 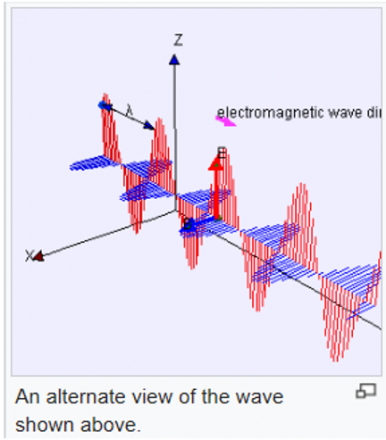 The two components of an electromagnetic wave, the electric and magnetic field components, are shown in the previous electromagnetic wave diagram. In the diagram, the electric field is in a vertical plane (Z axis) and the magnetic field in a horizontal plane (Y axis). If we refer to the event at 10^-36 sec, when the "surface" gluon particle intruded in our universe, it seems that it joined perpendicularly to the existing "surface" neutrino which adopted electrons. Both surface particles originated from the Planck epoch, before the universe became a “volume”; which means: when the universe was two dimensional. 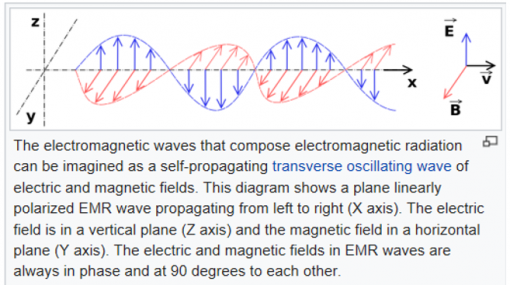 From the viewpoint of an electromagnetic wave traveling forward, the electric field might be oscillating up and down, while the magnetic field oscillates right and left. This picture can be rotated with the electric field oscillating right and left and the magnetic field oscillating down and up (either way, there's no up and down or left and right in space; but both are perpendicular to each other). This is a different solution that is traveling in the same direction. This arbitrariness in the orientation with respect to propagation direction is known as polarization. 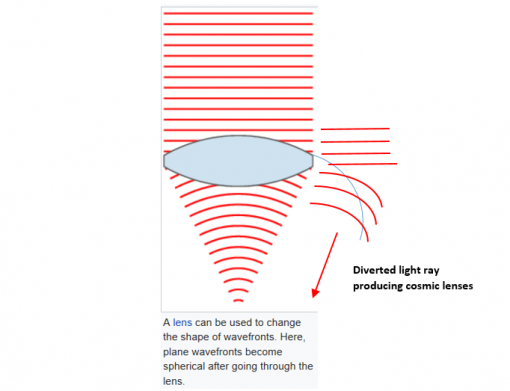 On a quantum level, it is described as photon polarization. The direction of the polarization is defined as the direction of the electric field. The wave front of electromagnetic waves emitted from a point source (such as a lightbulb) is a circle. A part of the wave front, when directly entering “altered space” would change shape and go toward the center of gravity; the rest would only deviate producing what we call gravitational lenses. Electromagnetic waves are produced whenever charged particles are accelerated, and these waves can subsequently interact with other charged particles. Would this mean that “acceleration” in involved when particles decay? Acceleration would then be the “vibration” producing the electromagnetic wave. But added info say that: Any electric charge that accelerates, or any changing magnetic field, produces electromagnetic radiation. And we know that a gluon is a magnetic field that changes in Quarks fields. Which brings us back to inflation period. In technical terms, QED can be described as a perturbation theory of the electromagnetic quantum vacuum. Which is what we found as electromagnetic waves being “perturbations (vibrations) of the electromagnetic universe. So we’re not so “off the track” after all. Even though I didn't advance at all in my positive and negative poles of the electron problem. I guess I'll come back to it someday. For now, I'm satisfied by the small progress made. My Sunday’s usual mind rambling. A funny idea came to me this morning. Let’s suppose that all neutrinos in the universe had adopted a “little magnet” electron and had distributed them in a way that all negative poles where facing each other, doing the same for the positive poles. All “little magnets” would repel each other and would “create space” between them, just as expansion does. I don’t think it’s what provokes expansion (although you never know when scientist can accept “repulsive” gravitation) but such a situation could have participated in the inflation period when electrons appeared. The helicity of a particle is right-handed if the direction of its spin is the same as the direction of its motion. As for massless particles, as the photon and the gluon, chirality is the same as helicity; and a massless particle spins in the same direction along its axis of motion regardless of point of view of the observer. A massless particle moves with the speed of light, so a real observer (who must always travel at less than the speed of light) cannot be in any reference frame where the particle appears to reverse its relative direction, meaning that all real observers see the same chirality. Because of this, the direction of spin of massless particles is not affected by a Lorentz boost (change of viewpoint) in the direction of motion of the particle, and the sign of the projection (helicity) is fixed for all reference frames. So it's now confirmed: photon and gluon particles possess a right-handed helicity. We know that neutrinos have a left-handed helicity. We then have a left-handed helicity with rotation perpendicular to direction, which means rotating in a different direction than the axis of direction. We find here, a definition of two different position/rotation in regard to the axis of direction; which can describe the difference between helicity and chirality versus direction of the motion for the neutrino. Here we have a right-handed helicity, with rotation in the same direction of the motion. Furthermore, we see that the two position/rotation are in the axis of the motion, which identify chirality as the same as helicity. Now let’s see what happens when we join them together as we said they did at 10^-36 sec after time = zero. Personally, I’d say that the result is starting to look as the components of an electromagnetic wave; wouldn’t you? Specially with the half spin of an electron which will be adopted by neutrinos. In most circumstances, two left-handed fermions interact more strongly than right-handed or opposite-handed fermions, implying that the universe has a preference for left-handed chirality (represented here by our neutrino surface that adopts electrons), which violates a symmetry of the other “forces” of nature. The general principle is often referred to by the name chiral symmetry. The rule is absolutely valid in the classical mechanics of Newton and Einstein, but results from quantum mechanical experiments show a difference in the behavior of left-chiral versus right-chiral subatomic particles. Let’s come back to consider the Planck’s units we worked with. We said that at the time 10^-43 sec, the universe appeared with a diameter of 10^-35 meter. This simply means that it took 10^-43 sec. to “fabricate” a 10^-35 meter universe. I wonder if the speed of 10^-35 m/10^-43 sec as any relation to the speed of light? I surely cannot make the calculation myself; maybe some of you can; but I, just as surely, can estimate and compare the two numbers in question. We know that 10^-35 meter equals 10^-33 centimeter. so, from -43 to -33 means a difference of 10 zeros between both time/length numbers. In our description of the Big bang at 10^-43 sec, we said that a fast counter clock wise rotating surface with a diameter of 10^-33 centimeter appeared, split by the middle, disappeared and neutrinos where projected in all directions producing the first volume of “space” with a diameter of 10^-33 centimeter. The splitting of the surface that first appeared projected half of itself in our universe while the other half went back to Planck’s epoch (status) rotating clock wise (the splitting event projection reversed the rotation). If we apply the same splitting event to the “speed” we designated at the Big bang, out of the ten zeros, five of them went back into the Planck’s epoch and five where projected in our expanding universe. It also indicate that half of the "speed" energy (kinetic) produced during Planck's epoch was projected to create our three dimensional universe (volume). The other half of the energy pulled together (origin of the topology of the gluon particle) and went back, rotating clock wise, to Planck's epoch, continuing to augment its energy and its surface until it reached a diameter of 10^-33 centimeter in order to reappear in our universe. Thus making the amount of energy inside "matter" a lot greater than the one existing in "flat" space. It also identify the energy inside "matter" (mass energy) as kinetic energy and, by the same time, the right handed helicity of the gluon particle. What I note is that “light speed” being a little less than 300,000 km per second possess five zeros. Only people capable of doing the calculation of the “speed” at the Big bang could say if there’s a relation to this observation of the split 10 zeros. Another point that tickles my mind is to calculate the volume of a universe that would have a diameter of 10^-33 centimeter. What would be the cubic size of that volume? But that will be enough “mind rambling” for this Sunday; I’ve got to prepare myself for being serious tomorrow. -Sorry about that; I was "mind rambling". Have a nice day to all. So if this is the case, it would mean that all our measurement of “mass” are not exact. Could that be the explanation to the unobserved “mass” which made science imagine “dark matter”? My last question was "dumb" because we do not add all proton mass to know the mass of Earth; it's calculated with Kepler's law. Which means that we could verify the mass of the Moon if we could add the mass of all atoms that compose it and compare with the result from Kepler's law. If it was possible to find the number of atoms of the Moon; which I doubt. I had a funny experience today. I received an E-mail saying that a certain science forum, from which I exited last year, was missing me; so I went back and put two new posts. Both posts where deleted because the were qualified as "allegations". In another E-mail, I was asked: "please post the peer reviewed reference that makes these claims that you have posted above." The said allegations where the basic metric of the universe of 10^-35 meter which I had named as Planck's length. So the references asked where: "Which scientists say that the basic metric of the universe is Planck's length?". I simply "unloged" myself from the forum. But then I received another E-mail stating a reply in the thread I was watching. It describes perfectly the kind of logic used in science to make deductions. What is space made of?" is a very tricky question…it is created by the relationship of matter to itself. If we have one single star with no others around it, space is wherever the matter from the star is not. Without the star for a reference, there is no space. So with a single star, you have space all around it; but if you eliminate the star, all the space around it falls into nonexistence. That is nonsense. I agree that it disappears, which means that we cannot have a reference to compare it; but it’s far off from “falling into nonexistence”. Specially since the lonely star itself occupy space. Which means that "space" is there even before the star occupy it. Another way to look at it is that space has to exist in order that stars "form". In fact you can even measure any distance of it, if you use the basic metric of the universe 10^-35 meter. That basic metric is already a measure. You'll even be able to measure all of the universe if you measure until you get to a “no-space” status; where you’ll get the measure you are looking for. It is not necessarily made of anything. For a single photon to reach the speed of light, the whole universe would need to turn into that one photon. Which is exactly what we came to accept previously here, in this discussion. It is agreed that we couldn't do otherwise. The field we talk about, here, is simply the “universal field”. This is an affirmation, which I think is based on maths and that everybody believes without calculating it; but we have to re-check it with logic. If a distance is contracting, at constant speed, it will take fewer and fewer time to cover that distance. So when distance contracts, times contracts just the same; whatever the maths. Finally, it is science that is a "very tricky question". And we are very lucky to be able, here in personal theories, to discuss on notions that are "freely" deleted by other science forums. Does light-speed results of a physical constraint or an energetic constraint? It seems to me that it cannot be a physical constraint, simply because since our universe is “flat”, there’s no possible physical, at least geometrical, constraint that could be implied to the speed of a massless “whatever”. As for the “weight” of energy itself, it becomes difficult to even consider it, since we cannot define energy before it is applied on matter. Which means that we don’t know what energy is exactly. Knowing what energy does, does not tell us what it is. Some of us even think that without matter there’s no energy. Steven Hawking and others thinks that there’s as much positive energy as negative energy which, to them, means that the total energy of the universe is zero. But which to me, doesn’t mean at all, that the universe has zero energy; in fact, it would mean that the universe has twice as much energy as its positive energy. Besides that, we also know that energy transforms itself in all kind of different energy. So it leaves us only one possibility, which says that: since kinetic energy provokes motion, it is the amount of the total kinetic energy, disposable in our universe, that establishes the constraint on light-speed. In other words, light-speed cannot be surpassed because there’s no enough (or more) energy in the universe to do it. This last assessment confirms that “flat space” is “motioned” by kinetic energy directed “toward every points” at light-speed (expansion), while “altered space” is kinetic energy “toward one single point” (gravitation) that was added to existing kinetic energy in our expanding universe, sometime after the Big bang. And that was what started inflation (of space) at 10^-36 sec. Furthermore, since all kinds of different energy is observed exclusively inside "altered space", it means that the kinetic energy devoted to expansion doesn't transform itself. Which leaves us with the problem of "accelerating" expansion. If this is proven a "fact", it would mean that kinetic energy is, somehow, ejected from "altered space" into "flat space" and makes irrelevant any sort of non-observable "dark energy". So, at 10^-43 sec after time = zero, the total kinetic energy disposable “decided” that light speed would be: 299 792 458 meter / second. Too bad that Planck’s epoch didn’t last a bit longer; at least to develop enough energy to reach 300 000 meter/second; which would have simplify the calculations quite a bit. This means that one second after Big bang, the diameter of our universe was 299 792 km. We will take the liberty to use 300 000 Km as a round number (I know; it shows laziness. So what? I’ll assume it). After one minute, the universe was 18 000 000 km which is about 1500 times the diameter of our planet Earth and about 1/8 of the distance between Earth and the Sun. After an hour, our universe was 108 000 000 km which is 42 000 000 km LESS than the distance Earth/Sun (Astronomical Unit = 150 000 000Km). At the end of the first day (24 hrs) the universe was a “balloon” with a diameter of 2 592 000 000km (17, 3 AU); which is 3 astronomical unit LESS than the distance from the Sun to Pluto. At this “speed”, it took about 2 years for our universe to get as big as the actual “reach” of the Sun’s gravity; which lies about halfway to the nearest star “Proxima Centauri” (in fact PC is at 4,25 light-years away). By the way, this suggest that gravity is not universal; which is to my liking. Our galaxy is estimates having between 100 000 and 180 000 light-years of diameter (how precise can we get? ); which means that our universe took at least 100 000 years to reach its smallest estimated size. This also means that the size of “space” (universe) when the CMB began, was near 4 times the smallest estimation of the size of our galaxy. We then “see” that when observable light started to “illuminate” the universe, “space” had a dimension 4 times as big as our galaxy. Another way to conceive the importance of these sizes is if we accept that one astronomical unit (150 million kilometers) is worth one dollar, the size of the universe at CMB was worth 6,320,400,000AUs X 4 = 25 2 81 600 000 dollars; that is 25 billion dollars (and remember; these are dollars that each are worth 150 000 000 pennies). Size wise the volume of the universe had a diameter of 25 billion times more than 150 000 000 kilometers; and then light was able to “flare” at the same speed as expansion. This also tells us that CMB is a lightwall that prevents us to "see" behind it with "visual" telescope. In fact, actually, even Hubble's telescope technology cannot "see" CMB. Inside that “space” volume, had develop all components of what we actually observe in our universe; and it had taken 380 000 years to do it. Since then, the universe continued to expand at light-speed; and today, the “balloon” has a calculated (and measurable) radius of 13, 77 billion light-years; which gives the total “balloon” a diameter of 27,54 billion light-years, plus an additional length of 380 000 light-years behind CMB. Whatever added dimension given to the universe seems to me only “bla-bla” based on calculated imaginations. But, as I usually say: I could be wrong. You made a mistake since it takes only around eight minutes for the light from the sun to reach the earth. After one hour, google's calculator says light has traveled 1,080,000,000 km, which is in fact about seven times more than the distance earth/sun. If the gravity from each one of the stars was not affecting the others stars in the whole galaxy, there wouldn't be any galaxy.